Kemp Financial | When Do I Stop Financially Supporting My Children? 14 Jul When Do I Stop Financially Supporting My Children? It’s natural for parents to want to help and support their children. But should that help continue well into adulthood? By helping too much, sometimes parents run the risk of imperilling their own financial future and creating dependence. 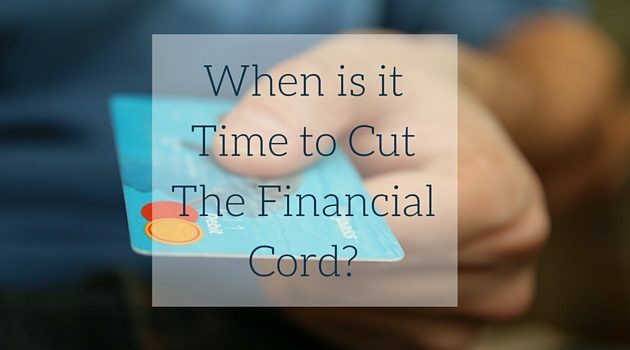 Time To Cut The Financial Cord? There always seems to be a new stage in our children’s lives- high school, university, grad school, etc. For most, you may not ever really stop supporting your children in one way or another. And although parenting is a lifelong commitment, a parents’ financial commitment to their kids change over time! And it should! While it’s safe to say parents never stop loving their kids, celebrating their successes and milestones as they grow up, parents who believe their children should grow into their own lives at some point, when is it the point to cut the financial cord? The cost of supporting older kids is a huge issue for baby boomers, who were born between the late 1940’s and early 1960’s, and who are now beginning to retire. The issue for these boomers is whether to dip into their retirement savings and compromise their own plans and lifestyles for their children. According to the latest data from Statistics Canada shows that 60 per cent of 20-24 year-olds and nearly a quarter of 25- to-29 year olds still live with their parents. While culture and family relationships play a role in why kids are relying on their parents for much longer, economic reasons would be the main ones. Which puts us parents in a predicament, because we have to face decisions we hoped we never had to. As a parent in today’s day and age, we are now prepared to make many financial sacrifices for our children. This includes delaying retirement, dipping into funds, or even saving less for their own retirement, because despite knowing that it will result in a less comfortable retirement it will help their adult children. There are many ways in which parents feel obligated to help financially – weddings, down payments on a home, grandchildren and so forth. But, it is important to remember that for parent’s seeking to help their children financially, they need to make sure that their own future isn’t in harms way. The best way to manage the possibilities of financially supporting your children in their adult years, is to come up with a sound financial plan. A financial plan that works for you and assists your children in the most economical way possible! These decisions can range from setting up a RESP to making shifts in your own investments or savings patterns. At Kemp Financial Group we provide sound financial advice and expert financial services, that will help grow, protect and transition your wealth in the most tax efficient way possible from one generation to the next.